Without nature, human being is nothing. Our existence is possible because of air, water, food and other requisites provided by nature. Not only survival, our well-being also depends on the generosity of nature. We feel relaxed and become peaceful when we are surrounded by forest, sitting near the rivers, or touched by the wind from the sea. Even spiritual development is attainable when our mind is open for the ultimate truth manifested through nature. We, the Buddhists, owed a great deal to nature. The origin of Buddhism was found in nature since the Buddha attained enlightenment under a tree in a forest on the bank of a river. His first sermon was delivered in the forest. Many of his disciples achieved the enlightenment in the forest as well. It is not exaggerate to say that the connection between Buddhism and nature is inseparable. Nature deserves our respect and gratitude. Even the Buddha expressed his appreciation for the tree that sheltered him during his practice for enlightenment. Buddhists are therefore obliged to conserve the nature out of gratitude. According to Buddhism, even breaking the branch of a tree that has given one the shelter is as vicious as harming the friend who helps us. The Buddhist are advised to live in harmony with nature. Though we need nature to sustain our life we should do it gently in the same way as a bee collects pollen from the flower, neither polluting its beauty nor depleting its fragrance. But what is happening now is quite alarming. Nature is being destroyed all over the world, even in Buddhist countries. Forests are slashed and burned in the name of development. A lot of species, which we Buddhists regards as friends in cycle of birth and death, become extinct. And now we are going to reap what we sow. We are facing the ecological crisis which is threatening our survival as a species. The ecological crisis we are facing now is fundamentally a spiritual crisis. Deep in our mind we are disturbed by the sense of lack. But in our quest for fulfillment we get lost. We mistakenly believe that material acquisition will fulfill our life. So we try to accumulate material wealth as much as possible, at the expense of nature. But in spite of enormous material wealth we never become fulfilled. We are not aware that the sense of lack will disappear only when we attain inner peace, not having more materials. Without inner peace and fulfillment, human being will not stop destroying the nature for material gratification. This is one of the issues that all faiths can play the significant role in order to protect the nature. Every faith emphasizes the importance of inner peace and spiritual fulfilment. They can help people to realize inner peace and free from excessive material desire. 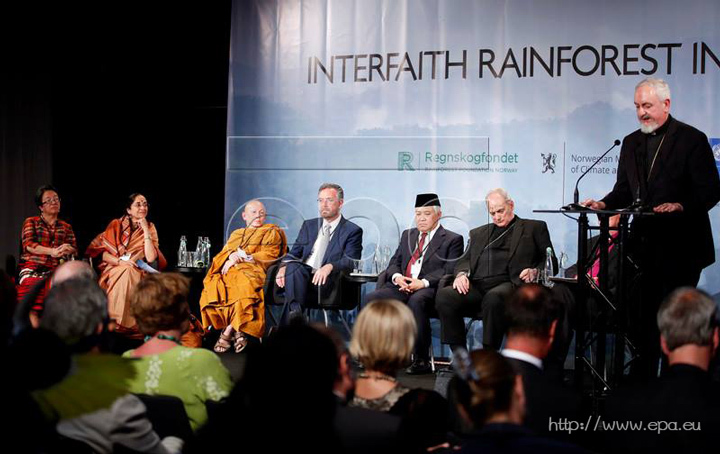 Cooperation among various faiths are badly needed since faiths are vital elements in the struggle against extreme materialism which is the main reason behind the global environmental destruction, especially massive deforestation. Faiths are also one of the most powerful cultural and social forces that can inspire people all over the world to work together to protect the nature for the common good of the humanity. They can join hand in hand in supporting the sustainable development and stop any policy that destroy nature permanently for short term benefit. Any attempt to reduce the gap between the rich and the poor should be sanctioned by all faiths since such gap contributes to the environmental destruction in various ways. All faiths should consult and come up with the alternative economics that aims for the enhancement of well-being, physically, socially, and spiritually, through moderate consumption. There are a lot of Buddhist communities in Thailand, especially Buddhist temples, that are working to protect the forest in different parts of the country. Many Buddhist traditions are applied to instill in people the sense of respect and gratitude toward the forest. They are also mobilized to stop illegal logging and deforestation. However, those attempts are not enough. More initiatives need to be done, and they should be done in cooperation with other faiths in the near future. Interfaith alliance is an important contribution to forest protection. I am happy and feel honored to be part of this initiative.